The National Dog Show is the Kennel Club of Philadelphia’s annual canine extravaganza to be held on Saturday and Sunday, November 17 – 18, 2018 at the Greater Philadelphia Expo Center, Oaks, 100 Station Avenue, Oaks PA 19456. WHAT: The National Dog Show hosted by the Kennel Club of Philadelphia is an annual celebration of dogdom, dating back to 1876. This cluster of American Kennel Club (AKC)-sanctioned dog shows is one of the oldest and most prestigious in the country. 240 AKC-sanctioned breeds will be among 2,000 of the nation’s top dogs competing for the title of “Best in Show”. 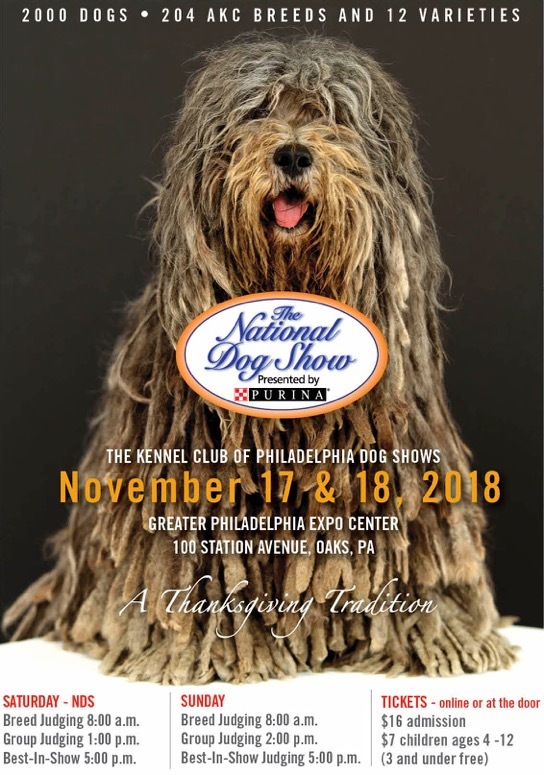 WHEN: The National Dog Show is scheduled for Saturday, November 17th, 8:00 a.m. – 6:00 p.m. and Sunday, November 18th, 8:30 a.m. – 5:00 p.m.
WHERE: The Greater Philadelphia Expo Center is located at 100 Station Avenue in Oaks, PA, adjacent to historic Valley Forge, and just 15 miles west of Center City Philadelphia. Contact the Greater Philadelphia Expo Center at (484) 754-EXPO. TICKETS: Tickets are available online at nationaldogshow​.com for the affordable price of $16 for adults, $7 for children (4–12) and free admission for children 3 and younger. Canine Partners for Life will receive the 2018 Kennel Club of Philadelphia “Dogs’ Best Friend Award” for 2018. The Kennel Club of Philadelphia (KCP) created “The Dogs’ Best Friend Award” to inspire and motivate others to contribute to animal welfare in their community, and protect our region’s dogs whose service and companionship are a critical and enriching part of American life. The award will be presented at The National Dog Show on Saturday, Nov. 17, at the Greater Philadelphia Expo Center in Oaks, PA. The KCP will make a donation of $5,000 to CPL in conjunction with the award.